Piles of trash, needles and human feces are now gone from a section of Morro Creek. So are the people who were living there. 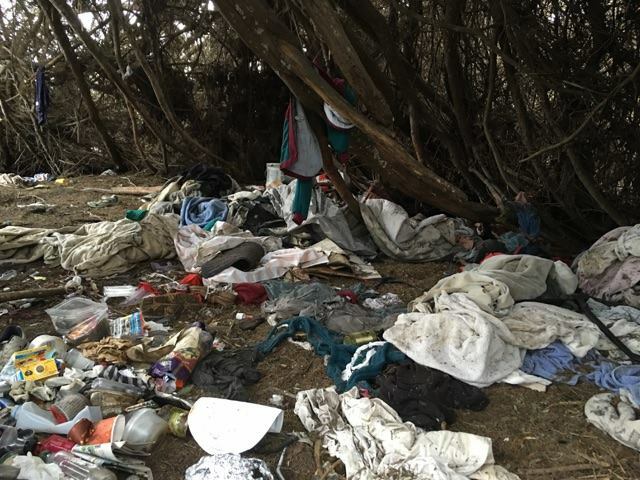 On Thursday, the city of Morro Bay conducted a creek cleanup at the location of a homeless encampment near Lila Keiser Park. 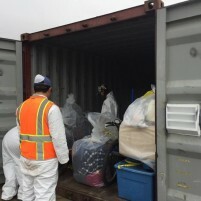 Workers collected all property the homeless left behind and placed it in a city storage container. Homeless individuals may retrieve their property. City officials said it was crucial to clean the creek prior to possible flooding caused by El Nino. “The amount of trash in these areas was often times overwhelming. To have that area flooded by storms would be a serious concern,” a city statement reads. Over the last month, officials provided notices to the people living in the encampment that the cleanup would occur. Morro Bay police and San Luis Obispo County Social Services workers also tried to reach out to the homeless to provide assistance. Additionally, city officials say Morro Bay has a volunteer coordinator who connects people with social assistance programs throughout the county. Last month, two children were pricked by a needle while playing in the creek as soccer games were taking place at the park. It is unclear whether the kids contracted anything form the needle. The children will be retested this month and again six months following the incident. Police officers frequently made contact with the homeless population in the creek. There were about 130 calls for service in the area over the first 10 months of 2015, according to the city. Part of the area where the homeless were living is owned by Dynegy, the owner of the now-closed Morro Bay power plant. The Morro Bay police, public works, fire and harbor departments worked in conjunction with city administration on the cleanup. The California Conservation Corps led much of the trash cleanup effort. City officials say they used guidelines and discussion with the homeless to distinguish trash from property. The trash and people are gone, for now. This is, as alway, temporary. Homeless shelters are open for the cold season and like migrant birds the homeless will return during warmer weather. Nothing accomplished. Morro Bay city Manager is too busy trying push his and councils agenda, harrassing tax paying homeowners. He certainly can’t be bothered addressing dangerous situations citizens are subjected to daily or the hundreds of police calls made involving Homeless druggies. There is no money to be made from the homeless so priority # 1 in Morro Bay is to invent regulations that the city can attach a fee to. The city did nothing when children were stuck by drug needles except to tell parents to keep kids away from the homeless hamlet. The most dangerous park is Lila keiser. This also happens to be the designated park for the city’s recreation department programs such as baseball and soccer. So far the official solution is to advise parents to avoid the homeless area? Parents should do just that, band together and boycott parks and rec until the city decides that our families are worth protecting. In the mean time the city manager and council is trying to take away your right to keep RVs or boats on your private property. The city is turning to rules of condo associations for total control over all homeowner rights while protecting Criminals. Is it election time yet? It’s not just about the potential for flooding. If I toss a candy wrapper out of my car window I can be fined, yet we’re going to allow these bums to make a sty out of a public creek? The picture looks like it should be a superfund cleanup site. Give ’em a bus ticket to Santa Monica “the home of the homeless”. How about San Luis Creek next? Put on some mud boots and give yourself a tour. In the 70’s the only people in the creek were children, playing and fishing. If California creeks had some water in them I could see the outrage, but let’s face it – the average homeless person hasn’t a 100th the carbon footprint you home-owning, Expedition-driving NIMBY’s have. Why shouldn’t they live on a dry and/or trickling little excuse for a creek? Sloth? Did you miss that coat hung up on the tree? Can we give them a bus ticket to down town San Luis? I’m sure Mayor Marx will take care of them in all the new hotel projects she wants to jam through. Yes, of course. The reason given for the 75′ 7 story building at Santa Rosa and Monterey was the need to provide “affordable housing”.